Product #18627 | SKU DS214+ | 0.0 (no ratings yet) Thanks for your rating! The DiskStation DS214+ 2-Bay Diskless NAS Server from Synology comes equipped with two hot-swappable drive bays each capable of holding both 2.5" and 3.5" hard drives and solid state drives. The drive bays support a combined storage capacity of 8TB, one 4TB drive in each bay. This NAS server also comes equipped with two integrated Gigabit LAN ports allowing you to share the large storage capacity with up to 2,048 user accounts, 256 groups all with a maximum shared folder capacity of 256. The DS214+ features a dual-core 1.33GHz processor and 1GB of DDR3 RAM ensuring quick and efficient access to data supporting data read speeds up to 208MB/s and data write speeds up to 153MB/s. Along with enhanced internal hardware components, the DS214+ comes outfitted with two USB 3.0, one USB 2.0, and one eSATA ports allowing you to easily connect a variety of peripheral devices. You also benefit from an integrated 92 x 92 mm fan keeping all of the internal components cool. This NAS server streamlines the process of sharing data throughout a LAN. In addition to storing and sharing your saved data through a local network, you can also share data and manage your NAS server remotely via DS file app for both Android and iOS devices. This intuitive application allow you to use your iPhone, iPad, and a variety of Android devices to remotely access any file stored on the DS214+. The Synology DS214+ comes with a dual core CPU complete with a built-in floating-point unit, 1GB DDR3 RAM, dual LAN ports, SuperSpeed USB 3.0 and the tool-less drive trays for enhanced overall system performance. The built-in floating-point unit enhances the overall capability of the main CPU to enable higher working efficiency. With RAM twice the size of its predecessor, the DS214+ also exhibits a boost in multi-tasking performance. Under link aggregation, the DS214+ delivers over 153MB/s write speeds under RAID 1 configuration on a Windows environment, and over 208MB/s read speed. Take advantage of seamless file sharing across Windows, Mac, and Linux platforms. Windows ADS and LDAP integration allows the Synology DS214+ to quickly and easily fit in an existing business network environment with no need to recreate user accounts. Windows ACL support provides a much finer-grained access control and efficient privilege settings, allowing users to enjoy a native Windows experience. Internet file access is simplified by the encrypted FTP server and the web-based File Station. HTTPS, the built-in firewall, and IP auto-block support ensure file sharing over the Internet is protected at a high security level. For users who are always on the move, Synology provides a handy app, DS file, for mobile devices such as iPhone, iPad, Android and Windows Phone. Anything stored on the Synology DS214+ can now be accessed remotely using DS file. The Synology DS214+ runs on the Synology DiskStation Manager (DSM), which offers comprehensive applications and features designed specifically for office and business workgroups. Cloud Station allows users to sync files among multiple devices, including Windows PC, Mac, Linux, iOS and Android tablets or phones, keeping everything up to date. The Mail Server package turns the Synology DS214+ into a dedicated mail service provider, while Mail Station, provides a webmail interface for users to access emails stored on Synology DS214+. The VPN Server package offers an easy VPN solution that turns the Synology DS214+ into a VPN server, providing a secure way of connecting to a private LAN at a remote location. RADIUS Server strengthens network security by overseeing wireless access authentication via RADIUS (Remote Authentication Dial-In Service) networking protocol. As to environment security, Synology Surveillance Station offers a centralised interface to manage IP cameras deployed in your office or home, allowing users travelling miles away to safeguard the environment by watching live views, recording events, and taking snapshots with a computer or iOS/Android device. Synology DS214+ offers a centralised backup target to consolidate fragmented and unstructured data across a network. PC users can back up their data to Synology DS214+ using Synology Data Replicator software, while Mac OS X users benefit from native Apple Time Machine integration. 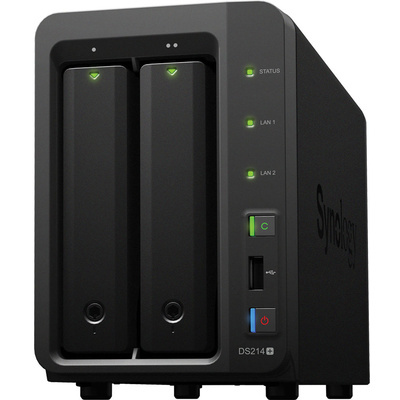 A backup wizard is provided for backing up data from the DS214+ to another Synology DiskStation or any rsync server via an encrypted connection, or to an external hard drive via USB 3.0 or eSATA connection. The wizard also makes it easy to back up DiskStation data to the cloud via Amazon S3 or Glacier cloud service. In addition, users can back up and restore DiskStation shared folders in multiple versions using Synology Time Backup package. Shared Folder Sync allows users to synchronise a specific folder from Synology DS214+ to another DiskStation- a server-to-client backup mechanism that takes place whenever something is changed on the server side. Users will be able to share documents locally with a seamless and safe encrypted connection. When your DiskStation is down, you will be able to have an immediate backup running in no time. The Synology DS214+ is designed with energy efficiency in mind. Not only does it provide a 92 x 92 mm fan and the smart airflow feature to keep the enclosure running cool 24/7, its noise dampening design makes it really quiet compared to PC counterparts. The support of multiple scheduled power on/off and System Hibernation can further reduce power consumption and operational costs.